In the end, the Day Porter is whatever our customers need them to be to make their facility run smoothly. So whether it is setting up last minute for that unplanned meeting, or pitching in to help an employee change offices, your Day Porter can be there to help. Your Stathakis Day Porter is trained to interact with the people in your building on a professional level. 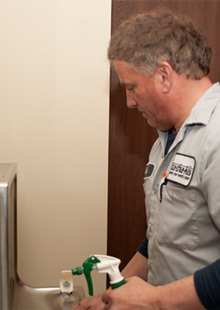 Their very presence will make your staff feel better about the cleanliness and health of your facility. Contact Stathakis today at (800)278-1884 so we can assist you in designing a Day Porter Program to meet your specific needs. Day Porter Support. If your business needs touch-ups throughout the day, a day porter could be a great solution for you.